Some of my family members were long-time missionaries in the Philippines and I have always enjoyed hearing stories of their life and adventures. And my childhood best friend took the Gospel overseas and has shared many of her stories with me. I have loved hearing the stories of how they share Christ’s love with people of a vastly different culture. 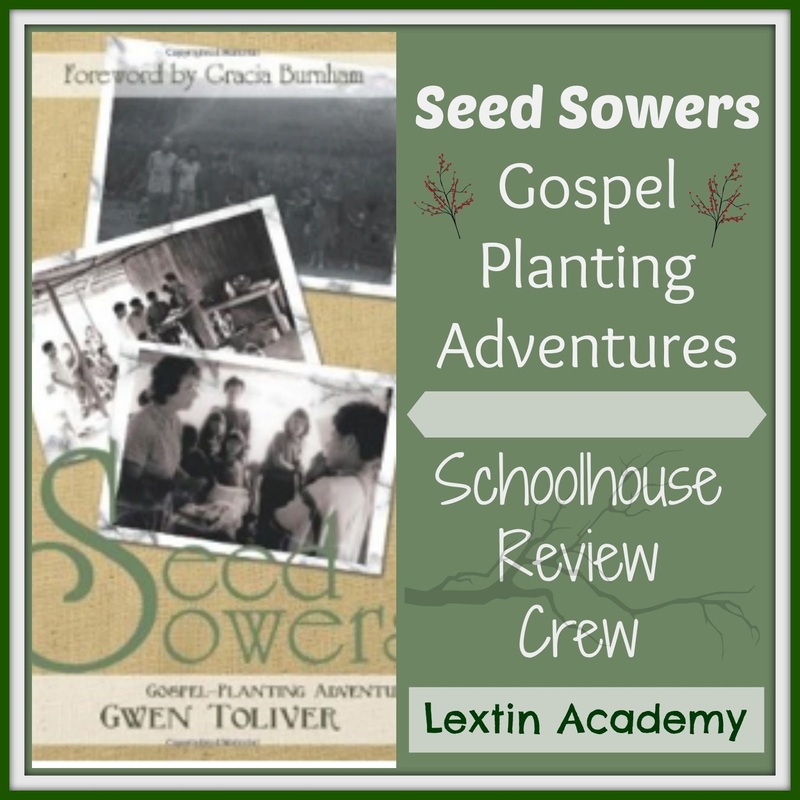 So I was excited to have the opportunity to review missionary stories for my family to enjoy from Seed Sowers: Gospel Planting Adventures. Seed Sowers: Gospel Planting Adventures is a collection of missionary stories that detail how translators lived, worked, and served in various countries and among different ethnic groups to learn the language, share the Gospel and eventually share the story of Christ with the native people. The book details their hardships and adventures as they strive to understand a new culture and reach a previously unreached people group. The stories in the book were compiled by Gwen Tolivar, a homeschool mom of 8, who has been serving with Wycliffe Associates. Wycliffe Associates serve to advance the translation of the Gospel into other languages. Gwen interviewed retired Bible translators to record their stories and adventures in this book that is written for children. I received the e-book version of Seed Sowers, although you can also purchase a physical book from Grace and Truth Books. The e-book retails for $3.99 for Kindle. This book was written for children, with an independent reading level of about 6th grade or above. It is also well suited to being a read aloud for families as the stories are short. There are 21 different missionary stories in this book. There is also information at the end of the book about Bible translators, like the work of a surveyor who first visits a newly discovered people group to analyze their culture, language, and habits. You can read an excerpt from one of the chapters here. What an absolutely amazing book! I cried all over my iPad while I was reading the stories. My husband finally gave in and asked me what my problem was, so I shared all the stories with him. And after reading the stories for myself, I selected a few to share with my young Crew. They were a wonderful springboard for a little geography study of the various countries as well as some Scripture study to read about how to share the Gospel with others. The stories began many fun and touching discussions. One of my favorite chapters was chapter 4 – When the Tall Lady Cried. This chapter was about a missionary family in a small mountain village in Asia who were working to translate the Bible into their language. This small village was very primitive and had very unsanitary living conditions. One of the young children became very ill due to the poor living conditions and no one was sure what was wrong with the little girl or how to save her. Even when the child was taken to a doctor, she was shunned because she was only a child of the mountain people and the doctor did not want to take the time to care for her. The missionary mother was heartbroken for this small child-a good friend of her own daughter-and the poor mother. She knelt beside the body of the dying little girl and prayed while weeping openly as the other village mothers stood nearby watching. As an answer to prayer, another doctor agreed to look at the girl and she was taken to a nearby hospital. One month later, the girl returned to the village and she was well again. The Bible translation for the village people was finished ten-years later and when the missionary woman visited the family of the young girl to say goodbye, many village women were waiting for her. They told her that it was not customary to cry over children in their culture and that when they saw the missionary weeping and praying for a young child who was not even her own, they saw firsthand the demonstration of Christ’s love toward them. The stories are wonderfully written and are captivating. Reading these stories of the missionaries and Bible translators has given me such a respect for what they do and the sacrifices they have made. I have loved reading these stories with my family and sharing how the Gospel can be spread. These are stories that we will be reading for a long time to come! Read other Crew Reviews on the blog! I think I will have to order this book for our family to read aloud. I've heard too many good things. Thank you for sharing your thoughts! Thanks so much for your kind words. Hearing these stories in person brought me to tears many times too. The people I spoke with are amazingly humble, only wanting to give God the glory for the incredible things they accomplished. What a remarkable lesson to be learned! Thanks again for review. May the Lord bless your family as you serve Him together! Thank you Gwen! We really enjoyed the book and will read it many times I'm sure. We really appreciated that the stories were adventuresome but still very family friendly so all of our kids could listen together.